sirri's world: Looking for a MEME Generator for Windows 8 / 8.1 PC - Tablet ? Try this.. Looking for a MEME Generator for Windows 8 / 8.1 PC - Tablet ? Try this..
EDIT: Now supporting "multi image" and built-in crop features, seems to be the best meme generator for windows 8.1 OS available at windows store. We all know that windows store is not very rich yet. If you like to create funny MEME's on your own: You can try funCAPSmatic Meme Generator. It will let you write anywhere you like on your imported image. You can change background color (or transparent) and also font size and type. The fonts will be automatically resized according to make it look beautiful. The software is not free but has a one day trial, so if you like it you can buy this at minimum price a software at windows store can be. 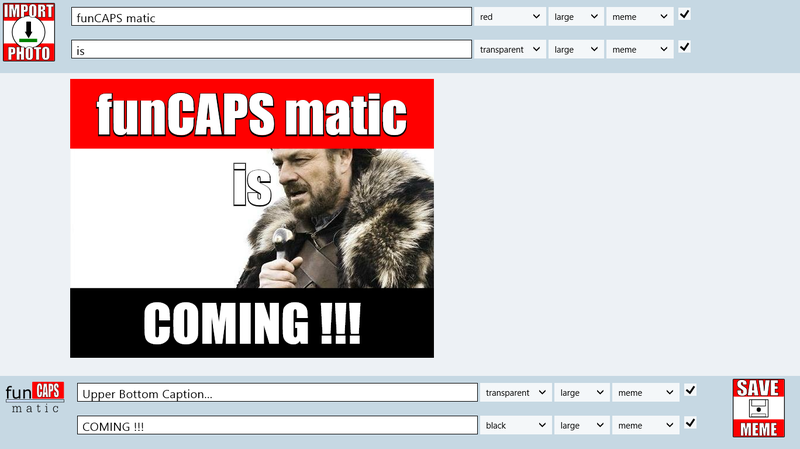 funCAPSmatic is told to be upgraded, which is also a good thing.